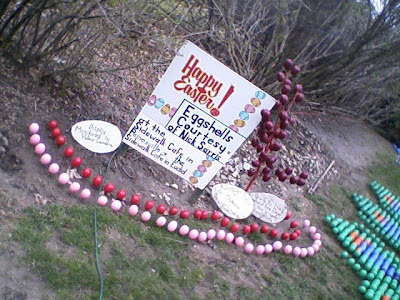 Eggshelland is the front yard of a house in Lyndhurst, Ohio (the same CLE suburb where the Goat grew up) that's full up with colored eggshells for Easter every year. The Goat mandated that we visit Eggshelland yesterday. It's just across town. Animals were the theme this year. 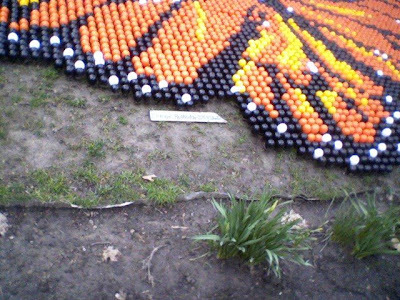 Enameled eggshells are available for sale. 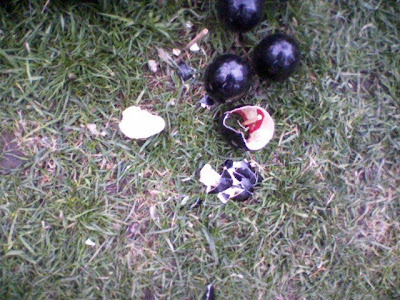 Some of the eggshells break. This is part of an eggshell butterfly wing. 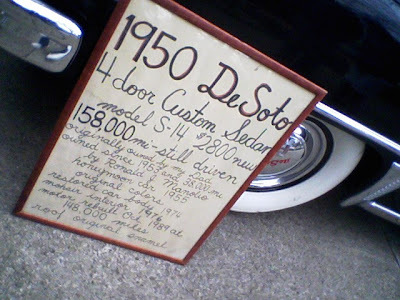 The Manolios (creators of Eggshelland) also display their vintage DeSoto. 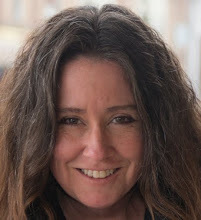 Eggshelland is the feature of a full-length film of the same name that debuted last night at a local theater. Have fun in your own Eggshellands everyone. Enjoy plenty of Jelly Belly jellybeans (but not too many) and be good to the other bunnies. That's only a couple of blocks from where I grew up. I'd feel kind of nervous going there. I'd be walking on eggshells! 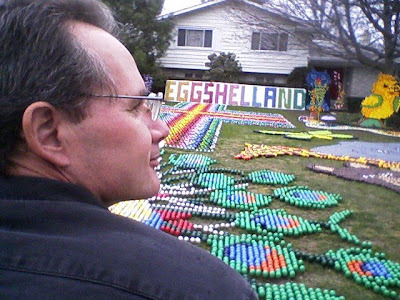 Eggshelland appears to be sort of like Twitty City only less narcissistic. 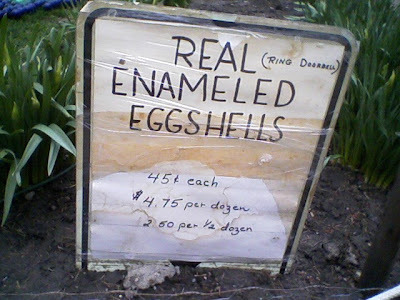 PS--I am glad they still sell "Real" Enameled Eggshells--never compromise; never surrender! Here you go Fool, and here! 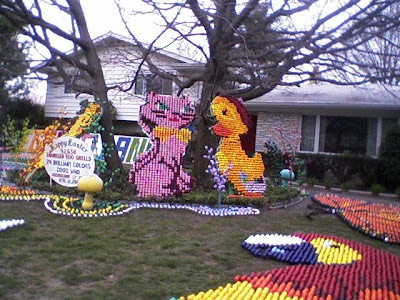 b)that's one hell of a lot of eggshells. i'm kind of scared. c)i don't believe i've ever been on an easter egg hunt, nor made an easter egg, though i've always wanted to. same way i've always wanted to decorate a christmas tree. yes, i know i'm Jewish, but those things look so fun! And the rest of the pics are verily cool.